Your QuickBooks company file contains a large part (if not all) of your important company data, but our understanding of that data is limited by the views that QuickBooks provides to us. They have a lot of “canned” reports that are very useful, but every business has its own unique situation that isn’t covered by those standard reports. Today I’m going to talk about a resource that a lot of people don’t know about, the QuickBooks Library Reports. This is a wonderful source for reports as well as another way to export your data, and it is free! In QuickBooks, select Reports, then Memorized Reports, then Memorized Report List. Click the Memorized Report button and select Import Template. Locate the report and “open” it. It will be saved to the memorized report list. MAKE SURE that you save the “QBR” file that you downloaded, because QuickBooks sometimes has a problem where it loses memorized reports. Take a look at the list of reports – it is very extensive. I found a number of reports that would have solved problems that people have been asking about in the QuickBooksGroup user forums. Unapplied Customer Payments and Credits: listing all payments from customers that are unapplied. Unbilled Mileage by Job: Unbilled mileage marked as billable, subtotaled by customer job. Contacts for Pending Invoices: A list of your pending sales for each customer, showing the customer’s contact name, phone and email address. Customer email list: Customer email address and current balance for each customer. This is just a sample. The list is very extensive, and worth time exploring. Purchase the ODBC driver (www.qodbc.com) and use a tool like Access, Excel or Crystal Reports. Note that if you have QuickBooks Enterprise you already have this. It takes a bit of work to use this tool. Purchase another export/synchronization tool from the QuickBooks Solutions Marketplace – there are several that work with various database/reporting tools. Get the Programming SDK and write your own program (very complicated). For the most part these approaches cost money (the SDK is free, but complicated to work with and you may need a programming tool). The QuickBooks Report Library provides another alternative if you have Excel. If you scroll down the page a ways there is an Excel section that contains a QuickBooks Workbook with Wizard and a QuickBooks Workbook. These tools provide you with a way to extract transaction information from QuickBooks into Excel. You can use them as they come, or you can play with them to modify what information you can extract. This is still a bit complicated, particularly if you want to modify what you can get. If you are comfortable with playing with VBA (Visual Basic for Applications) then you can get a lot out of this. The nice thing is, it’s free (if you have Excel). Download the worksheet and open it with Excel. Most likely you will run into some security issues – Excel will not let the program run fully unless you take care of some permissions. There is a Security Guide worksheet that will explain what to do. As you can see, this pulled out inventory adjustments, invoices, and assembly builds (this is just a sample). If you are trying to get transactions out of QuickBooks this can be a simple and cheap way to start. If you try this spreadsheet, or if you use any of the reports from the library, post a comment here about what you found that you like (or don’t like)! 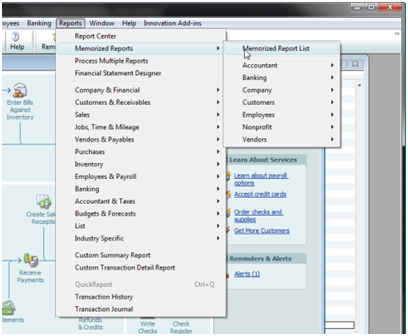 I need a report that I can not find in standard QB or in the Quickbooks Report Library. In QB, when running a customer list, and using the Modify Report button, the available fields to select for the report does not include the “Exp. Date” field. I need a report of all customers showing their credit card expiration date. This date is stored in a standard field on the Payment Info tab. The issue I have is that I don’t find out that a customers credit card has expired until after I have attempted to process payment through my Merchant Services account. I need reporting on this so I can get updated credit cards from my customers before we process orders and billing. How can I extract this data? Dave, credit card information can be a bit tough to extract from QuickBooks because they protect it, for obvious reasons. I believe that you could access this information via the ODBC driver (although I haven’t checked on that particular field), so you could buy that and use Excel or some other ODBC compliant tool to get the information. Alternately someone who uses the programming SDK should be able to get that information and build a report. For more details on that particular approach you can contact me at the address in the “about this blog” page listed at the top. I used the transaction list by customers for year end accounts receivable reporting. First, the total does not match my account receivable on the balance sheet, and second it does not pull in the discounts given. Why? Nancy, I’m not sure which exact report you are referring to. Is it from the Report Library they have? If so, what is the exact title? Off the top of my head, without seeing the report or your data, the first thing I’d check is to make sure that the dates on the report matches the date of your balance sheet – if they dates don’t match, the values won’t match. We are trying to generate Payroll reports using Quickbooks 2009. However, we do not Quickbooks’ PayCycle. Are there any reports out there that can help us get our payroll information? I am using a “positive pay” service at my bank. When I issue checks, I upload a file to them that contains bank account number, check number, amount etc. I need to do this in a csv format. I now have to recreate this file each time. Is there a way to automate this? Thanks for the website. I’m trying to make a report to show all invoices closed for a day by any method (payment, applied credit memo, applied credit from JE, etc.) Any thoughts? Thanks. Hi,I downloaded the Quickbooks_Linked_Reporting_Workbook.xls file but when I put in the dates I got an error message. Would you know whats wrong? Melvyn, that sounds like an incomplete installation of QuickBooks – or an older (or non-US) copy of QuickBooks that doesn’t support the interface. If you have a relatively current copy, try doing a “repair” of the QB installation. What version/edition/year of QuickBooks are you using, what operating system? And if it is Vista, do you have UAC enabled? I would like to export transaction into excel then audit and update transaction then import back into quickbooks, will your product do this? Richard, that is a bit complicated, if you are MODIFYING an existing transaction. Talk to the people at Baystate Consulting, http://www.baystateconsulting.com – not sure if an off-the-shelf product can do what you want but this is probably your best bet. Where can I download the “Quickbooks_Linked_Reporting_Workbook.xls” from? You mention : “QuickBooks Workbook with Wizard and a QuickBooks Workbook” but I can not find any link to it. Since this article was written Intuit rearranged the “Library”. Look for the “Reports” section. Under that is a link to “All Reports”. Click that. In the “Search” dropdown select “Others”. You will get a list of three options, “QuickBOoks Linked Reporting Workbook with Wizard”, “QuickBooks Linked Reporting Workbook” and another. Quick question – if one exports quickbook backup file (gives it to colleague) to be imported to another computer (in this case Quickbooks Pro 2010 was just installed), will the original exporter computer’s QuickBooks Pro 2010 preferences be imported to the 2nd machine as well? That is a bit off topic, but yes, the preferences are a part of the company file, so they are restored with the backup. I need to export invoices (report format is fine) to a csv or excel spreadsheet. I have Quickbooks Pro 2009. Alicia, you can use the ODBC driver (included in Enterprise, or purchased from http://www.qodbc.com) with Excel. A bit tricky if you don’t have experience with ODBC. 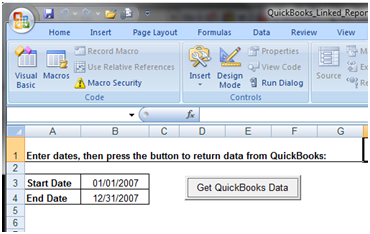 Found a free export utility for QuickBooks Pro at http://www.data-devil.com. Doesn’t support every transaction type, but it’ll work for your invoices. I need a report that can give me the breakdown of my inventory with its GL balance. Nelson, there are different ways of interpreting your request, and it all depends on how your system is set up. I can’t answer it directly without having hands on your system to see what you have. I recommend that you find a local ProAdvisor who can help you. Having trouble finding the very simplest reports. Report #1: If 7 clients each pay me per month, I need a report that sinmply states date of payment, amount of payment, cash or check, or credit card, and totalling the payments at the bottom of the report. Can anyone help me with generating a report like this? Or is there a resource on the Internet that has a report like this that I can download? A simple check registry showing only date of check, amount of check, payee, and total by date. CH Cohen: Several ways of getting this kind of stuff. I’ll give you some general direction to get you started. One approach is to get an addon product. I like the reporting capabilitys of QQube – see the review at http://www.sleeter.com/blog/?p=480. There are other reporting tools that can work also. 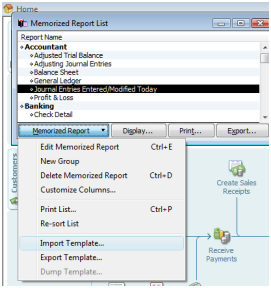 Another way is to play with the “Custom Transaction Detail Report” in QuickBooks. This is one of the more customizeable reports. You can set filters, and add fields. “Pay Method” is a column you can add. You can filter for payment transaction types. You can sort by “Name”. If you play with this report you may find that you get close to what you are looking for. If I pay via check, I would like to have a report that gives me the following: date of payment, reason for payment (Memo or Account) amount of payment, payee, and totalling the payments at the bottom of the report. Mary, what exactly are you looking for in a “workbook”? I have Quickbooks simplestart edition. Can I export my customer contact list into excel? Lindsay, I don’t have Simple Start around any more so I can’t be sure. I don’t think that you can – but that depends on how old a version you have (that is no longer supported in the US market). It also might depend on the national version you are using, as non-US versions differ from the US versions. Many years ago, I got a template from this resource which did EXACTLY what I wanted. Removal of that resource leaves me with a bad taste in my mouth about Intuit, at worst, at best, I’m very disappointed. Ah, that link took people to the old “Papyrus” site, which was something they were trying out to provide collaborative reporting. They’ve replaced that with the “contributed reports” feature in QuickBooks 2012 (see a reference to it here: http://www.sleeter.com/blog/2011/09/quickbooks-2012-wrapping-up-the-rest/ ). That new feature contains many more reports than the old Papyrus site. Looks like they forgot to update that web page. “Papyrus” is gone, it was a program in the Workplace App Center. Before Papyrus there was a static site that had reports. I’m not sure if that is around any more, probably not. I think that in the rush to provide shared reports with their new feature they forgot that older products can’t use the new site. I’ve asked some people about this, but I don’t know if I’ll get a good answer. The most likely answer will be that they’ll change the web site to remove the link, but we’ll see. In the meantime, I’ll update this article. Following up on this, Intuit fixed the link on that page so now you can find the reports. They didn’t realize that the link was broken, until I pointed it out to them (based on Georgie’s comment above). Thanks, Intuit! I am looking for a report that will give me sales by items, by customer comparing multiply time periods, such as this year, last year, etc. We are using QB Premier Manufacturing and Wholesale Edition. Is there any report like this for Quick books. No such in QB itself. You can create reports for an individual year and then combine them, with some work, in Excel. See http://www.sleeter.com/blog/2014/03/use-excel-vlookup-merge-quickbooks-reports/ for some tips. That is a program failure, internally. Either a bug in the program, or corrupted data, or a program installation problem. Hard to tell which. Start by doing a “repair” of your QB installation via your Windows control panel. After that, talk to QuickBooks support directly.